How much does it cost to travel to Sibenik? How much money will you need in Sibenik? Additional pricing is in the table below. These average travel prices have been collected from other travelers to help you plan your own travel budget. Sibenik is a city on the Adriatic coast of Croatia. It's known as a gateway to the Kornati Islands. The 15th-century stone Cathedral of St. James is decorated with 71 sculpted faces. Nearby, the Sibenik City Museum, in the 14th-century Prince's Palace, has exhibits ranging from prehistory to the present. The white stone St. Michael's Fortress has an open-air theater, with views of Sibenik Bay and neighboring islands. The city's magnificent medieval heart, gleaming white against the placid waters of the bay is enough to excite any traveler, and you won't be disappointed with your trip here. The stone labyrinth of steep backstreets and alleys are a joy to explore. 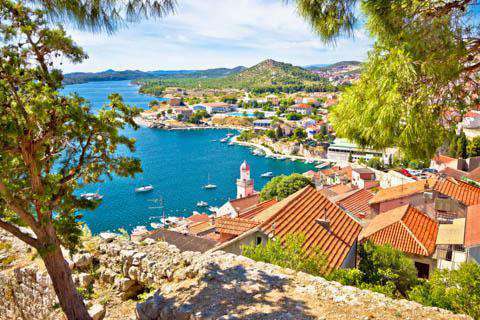 Sibenik is also an important access point for Krka National Park and the Kornati Islands. Sibenik's Cathedral of St. James, now listed as a UNESCO World Heritage Site, is one of the architectural highlights of the Dalmatian Coast. Started in the early 15th century, this grand cathedral took more than 100 years to complete. During the course of construction, a variety of styles were incorporated, including the Gothic lower level and the Renaissance upper level. One of the most noteworthy features is the exquisite frieze on the outside of the apse with its more than 70 unique faces representing ordinary townsfolk from the 15th century. Also of interest are the old manuscripts of Bishop Sizgoric, the Gift of the Wise Men by Ricciardi, and the Lion's Portal with its fine figures of Adam and Eve by Dalmatina and Bonino Milano. Just a short stroll from Sibenik Cathedral is the late Renaissance Rector's Palace, also known as the Count's Palace. Originally built to serve as the governor's residence during the time of Venetian rule, the building took its name from Count Niccolo Marcello, the Venetian who ordered the construction of the site in the early 1600s. Today, the Palace houses the city's Civic Museum with its many local archeological artifacts dating from Neolithic to Roman times, including sculptures (some from the 7th century), a coin collection, and other miscellaneous items from the surrounding region. The Historic Center of Sibenik is of most interest to visitors. It is here where many of the sights and attractions are located. The city most renowned for many churches in the historic center, they are really on just about every corner. Most of them have been repurposed as museums, galleries and other public spaces. Historic city center is built in stone, with extremely tight and winding streets with many staircases and arched passages. The rich heritage is best visible while navigating small plazas and numerous historic monuments of the city. The Marina Mandalina neighborhood is located just south of the city center of Sibenik. Mandalina is a perfect starting point for sailing Croatia, whether you choose to sail north or south. From Marina Mandalina you are within close reach of the islands of Solta, Hvar, Brac and Vis, all lying in close proximity to Split. North of Marina Mandalina is the Kornati archipelago, which is known by true sailors as a dream sailing location. Here you will find plenty of natural harbors, cozy bays and uncrowded beaches. Baldekin is the largest neighborhood in Sibenik, and according to some, the most beautiful part of the city. Here you will find many tall buildings and just about anything the modern tourist could want. It is a laid back, easy going area and people here are sociable and friendly. Take a swim! Beaches around Sibenik are extremely clean and fun. Join the locals and try the beach game of picigin, an invention of nearby city of Split's youth. All you need is shallow, sandy or not so stony beach, a small ball and company. The aim is to hold a ball as much as you can up in the air, and you're allowed to use all body parts. Visit Krka and Kornati islands national parks. Krka National Park is similar to the more famous Plitvice Lakes National Park. The park is full of breathtaking scenery of waterfalls, flora, fauna as well as historical and archaeological remains. Kornati National Park is famous for its numerous islands and its undersea. Walk through Kalelarga (King Tomislav's street) and visit its shops, squares and cafes. Come in time to enjoy the annual Sibenik International Children's Festival, founded in 1958, takes place every summer in the theater or the stage between the Cathedral and City hall, as well as on the streets and squares. The Sibenik area of Croatia has an interesting mix in gastronomy offerings, combining the continental and Mediterranean cuisine. Due to the cold and windy winter months, this area is said to produce some of the best prosciutto in Dalmatia. Most often, the prosciutto is combined with specialty goat cheese and bread. All sorts of seafood is available such as white and blue fish like sardines, anchovies, tuna all sorts of crab, shells and other fish specialties are readily available. Meat lovers will definitely enjoy eating young lamb which can be prepared in different ways, most often accompanied with potatoes or seasonal vegetables. Don't hesitate to try the locals favorites- Pasticada, a stewed beef dish made with homemade gnocci, or soparnik- a salty crusty pie filled with chard and olives, often served as an appetizer. And if you have a sweet tooth, the local rozata, fritule, or krostule are great options to curb your craving. Sibenik is accessible by Split and Zadar airports, and there is a bus connection from both to get you to the city. Sibenik is connected by railway to Split and Zagreb. Sibenik is well connected by bus with Croatia, surrounding countries and Central Europe. Sibenik is also easily accessible by car if you decide to rent one. Everywhere in the city is within walking distance. From bus station to the old city center it takes only five minutes to walk. You can get to all sights on foot, and the furthest are within half an hour walk.